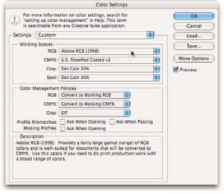 Management Policies area of the Color Settings dialog box, choose RGB: Convert to Working RGB. This ensures that the images you see onscreen actually use your working profile. Figure 3-16: Choose wisely in the Color Settings dialog box for optimal printing. l Turn off the mismatch warnings. Clear the check boxes for those annoying and time-wasting warnings that pop up onscreen any time you open an image with a profile other than your working space. You are intentionally converting to your working space — you don't need to reaffirm the decision every time. l Output using Print with Preview. When it's time to print, you'll get the most accurate and pleasing prints when you use FileOPrint with Preview. In the dialog box, click the More Options button. In the Color Management section's Print area, choose Document to keep the source space as your working space. In the Options area, choose Color Handling: Let Photoshop Determine Colors and select the printer's own profile for the paper on which you're printing as the Printer Profile. Use Relative Colorimetric as the rending intent and leave the Black Point Compensation check box marked. l You exclusively create Web graphics. In the Color Settings dialog box, choose Settings: Color Management Off. In the Save For Web dialog box, to the upper right of the preview area, choose Uncompensated Color. When saving images in the JPEG file format, do not embed ICC profiles. (ICC profiles make specific adjustments to the appearance of your images to compensate for vagaries of the hardware. I discuss color profiles in Chapter 4.) When you eliminate color profiles from the equation, you're creating Web graphics that any Web browser can show properly (or, more accurately, "as properly as the viewer's uncalibrated monitor can display"). l You prepare images for offset or flexographic printing. Your images end up in a CMYK color space. Communicate with the person preparing the page layout document in which your images will be placed or directly with the print shop. Find out what CMYK color profile you should be using (hopefully a custom profile designed for the specific press on which the job will be run). 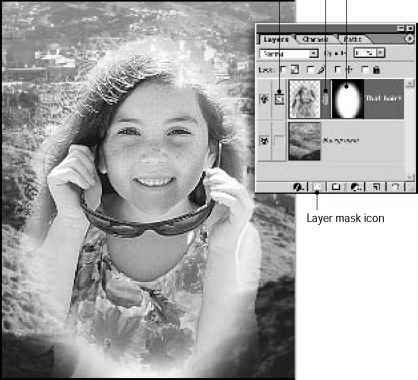 And, of course, there's the possibility that you will be expected to supply RGB images and let the conversion be handled by folks intimately familiar with the particular workflow through which your image will pass. l Your color management requirements are extreme. If color in your images needs to be absolutely perfect — merely accurate won't do — you should consider purchasing hardware and software to calibrate and profile all the devices in your workflow. GretagMacBeth (www. gretagmacbeth.com), ColorVision (www.colorvision.com), and Monaco (www.xritephoto.com) are three sources to explore. In order to achieve more consistency between Macs and PCs and among the programs of the Adobe Creative Suite, the Color Settings command is moved to the Edit menu for Macs.